Jacksonville, Texas- Jacksonville, Texas takes the second consecutive title, KTBS 3 Tomato Throwdown Champion. 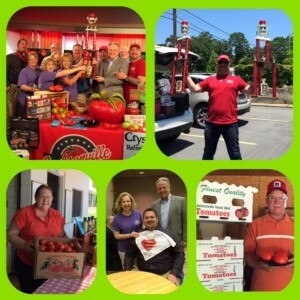 Peggy Renfro, President-Jacksonville Chamber of Commerce challenged two communities who also have a Tomato Fest, Crystal Springs, MS and Warren, AR. 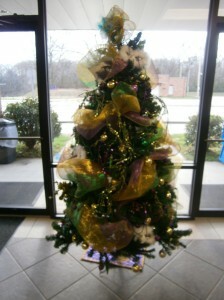 Both communities were up for the challenge which was hosted by KTBS TV station in Shreveport, LA. The challenge took place live during KTBS morning show displaying each communities tomato spirit and upcoming Tomato Fest events. There were fourcategories this year, 1) Best Plate of 3, 2) Largest Tomato, 3) Best Tasting Tomatoes and 4) Tomato Eating Contest. Jacksonville won 3 of the four categories, winning the Best Tasting Tomatoes from Guinn’s Produce, Best Plate of 3 Tomatoes from David Claiborne-The Tomato Shed and the Tomato Eating Contest won by Jake Meink and tomatoes provided by The Tomato Shed. The Tomato Eating Contest was a new category and Jacksonville’s 2014 Tomato Fest Tomato Eating Champion Jake Meink won by eating 3 more tomatoes than the other contestants. Jacksonville’s Tomato Fest will be this Saturday, June 13th hosting 29 events in one day. For additional information, contact Jacksonville Chamber of Commerce at 903-586-2217 or visit www.JacksonvilleTexas.com/pages/TomatoFest/ or follow us on Facebook www.Facebook.com/JacksonvilleChamber.